Gower, located at 12 Coogee Bay Road, Randwick, designed by the prominent architects Hennessy and Hennessy, has aesthetic significance as a fine and intact example of the Federation Queen Anne style, erected c 1912-15. The house is particularly important for its interior features. The original layout is enhanced by the intact details and fixtures. Externally, the asymmetrical composition and emphasis on gable, slate roofed components are dominant features. The dichromatic face brickwork and bay present a striking street frontage. The house has historic and social significance as a grand residence once typical of the built environment and gentry of the Randwick district. Combining stunning interiors and the finest of finishes, beautifully refurbished ‘Gower’ (built in 1920), is surrounded by exquisite gardens designed by Peter Fudge. Very good two-storey Edwardian house. Atypical design. Complex roof form. Projecting section on one side has gabled balcony above. Porch at ground floor is deeply recessed with enclosed balcony above. Little altered but for minor detail. Dark brick with arched entry to porch. Slate roof. Bay beside projecting section has its own roof and extensive leadlight glazing. Some very good timberwork on balcony. Sympathetic style picket fence. Well planted garden and lawn, with creepers on building. A good example of the style. Good streetscape in good location. The house was built for A McDermott Esq and designed by Hennessy and Hennessy Architects c1912-15. Coogee Bay Road was originally known as Belmore Road. After McDermott, a Mr Prentice is known to have owned the house. The Rowan family, owners of the nearby Royal Hotel, Randwick, then purchased the house from Prentice. In 1914, Harold Andrew Taylor purchased the residence and the residence has remained in the Taylor family since. Harold Taylor, builder, constructed the neighbouring Art Deco apartment block, Gower Galtees, in 1940 and completed works to the Brigidine Convent, also Coogee Bay Road. The residence is an example of the Federation Queen Anne style. It is a two storey building of a symmetrical composition. Walls are dichromatic face brick of stretcher bond with intermittent header course. Gable roofs feature slate tile cladding and terracotta ridge line. Terracotta finials and simple fascia treatment adorn the prominent gable ends. The gable ends feature close and boxed eaves and half timbered effect. Two chimneys with terracotta pots punctuate the roof line; the western chimney is tall and slender. 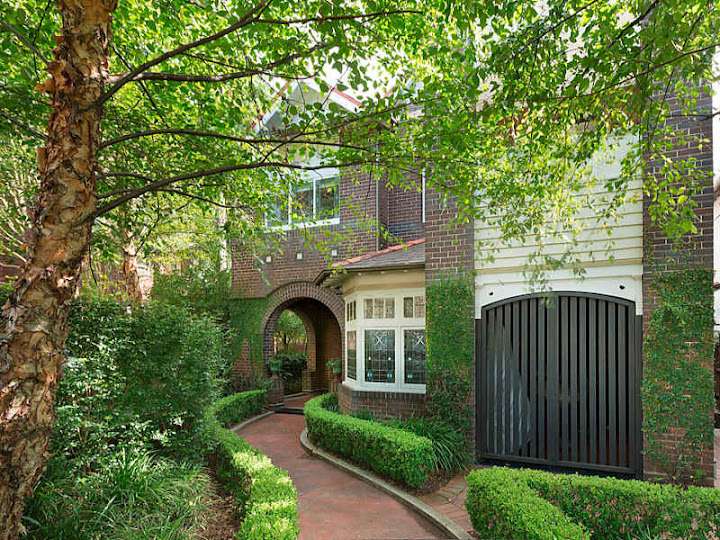 The south elevation (front, Coogee Bay Road) features a grand bay brick arch to the entrance porch. The adjacent, single storey, bay is three sided with matching roof. Windows to the bay are leadlight infills. Southern elevation features two verandahs on the first floor and one on the ground floor. On the first floor, the western verandah has been sympathetically infilled by casement glazing. The eastern verandah has an ornamental timber valance. There are two bays on the eastern facade, each with leadlight casement windows. The western elevation continues the general thematics of design and use of materials. The northern elevation, with accompanying rear yard, features an infilled verandah at ground floor level. The laundry is dominated by a round accent window and skillion roof profile of corrugated iron. 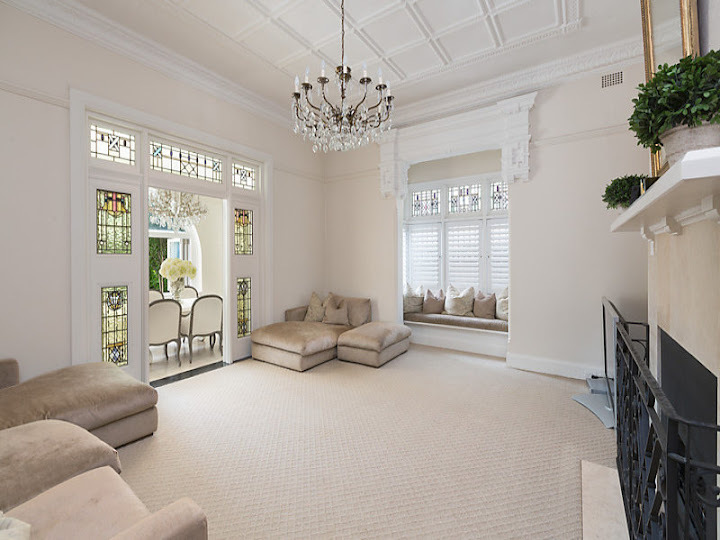 On the ground floor, the living room features an elaborate 11.8ft corbelled ceiling with heavy timber accents. There is some striking plaster work to the entrance surrounds of the bay and inglenook. The fireplace is characterised by dichromatic brickwork with liver brick arch and voussoir. Timber panelled dado and bracketed rail. 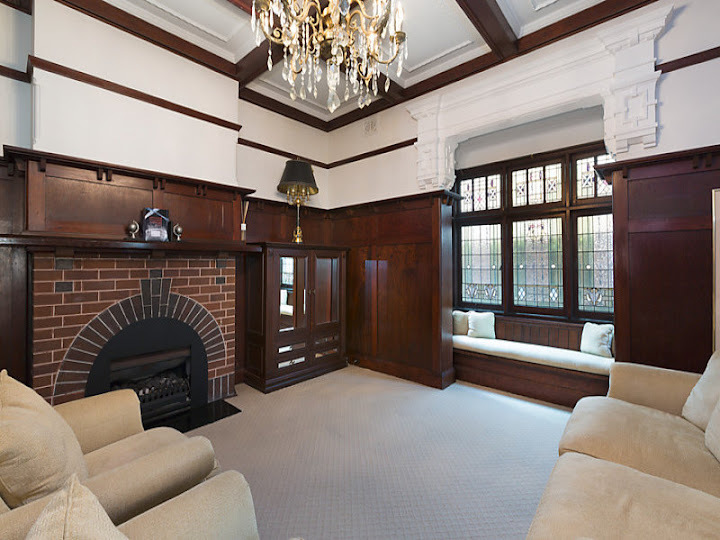 The dining room features a matching fireplace with rendered brickwork and matching bay. Ceiling is plasterboard with dining room and verandah, feature leadlight windows. Verandah has timber boarded ceiling and rendered walls. The kitchen and maid’s room are generally intact. Maid’s room features original wallpaper, believed to be from Beard Watson. A cedar stair rises from the entrance hall to the first floor. The stair features timber balustrading with floral motif, handrail and Art Deco/Chicagoesque inspired posts. Underside of stair features a pressed metal ceiling. The first floor contains four bedrooms, one bathroom and three balconies.